The new Xbox Experience has finally been launched, but only for those users that signed up for a preview of the service. 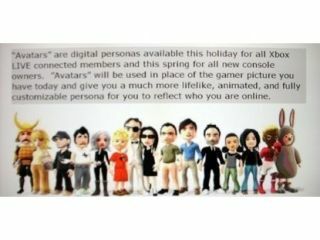 Everybody else is still going to have to wait a full day of earth time to get involved in Microsoft's Mii-like cutesy avatar-based Xbox user interface. While TechRadar looks forward to creating our own Xbox 360 look-a-like characters later this week. UK Xbox boss, Stephen McGill told us in a recent interview that the accusations of 'copycat' behaviour levelled at Microsoft were totally unfounded. Microsoft recently slashed the cost of its various Xbox 360 consoles, from the entry-level Arcade unit through to the 120GB hard-drive packing Elite model. Users will need at least 256MB to run the new Xbox Experience, with Microsoft rumoured to be offering 512MB flash drives for free to those gamers without any hard drive space on their Xbox 360 to enable them to get involved with the avatar-creating fun.